Davy Suvee, founder of Datablend.be and IT Lead/Software Architect in the Research and Development IT division of Janssen Diagnostics (Johnson & Johnson), utilized some recent downtime to create this data visualization of Bostonian bikers’ paths. Using data from Hubway, a Boston bike sharing system, he created a flow graph to demonstrate the movement and number of bikers using Hubway’s bikes. 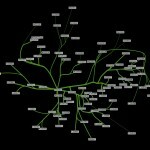 Davy Suvee will be presenting a talk called “FluxGraph: A time-machine for your graphs” at GraphConnect. Read the full article here, or try the Hubway Data Visualization Challenge yourself!